Circuit research is very important if your are studying Systems and Control or Electronics. You must show that you have looked at a range of circuits and components that could be used for your project. A range of software is available that allows you to build and test circuits on the screen of a computer and then simulate their operation. Use this type of software and consider building a temporary circuit using a breadboard. Two example circuits are shown below. Notice that for each circuit the INPUT, PROCESS and OUTPUT are clearly indicated. 1. 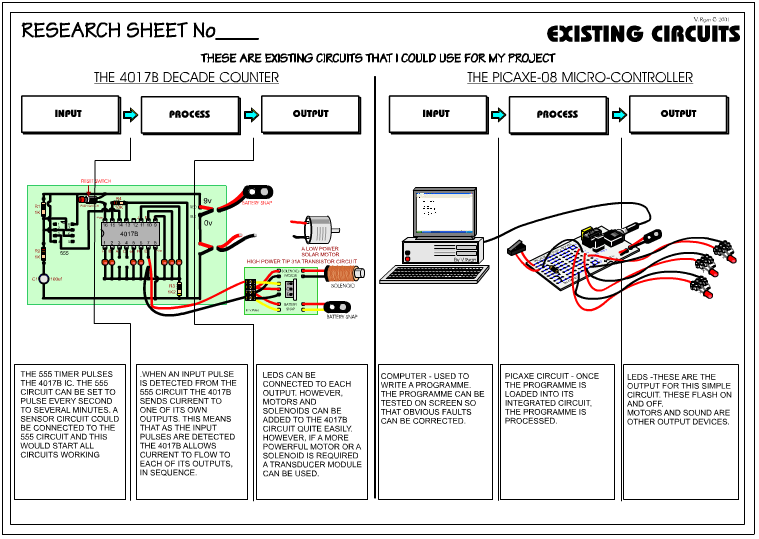 Draw at least four circuits that could be used for your project. 2. Your circuits should be complete with inputs, processes and outputs clearly labelled. 3. Place brief, to the point, notes underneath each aspect of the circuit. 4. Do not be too concerned with producing notes in great detail, an overview of each circuit is all that is needed at this stage. 5. Label components and if your feel it is necessary explain their function in the circuit. 6. 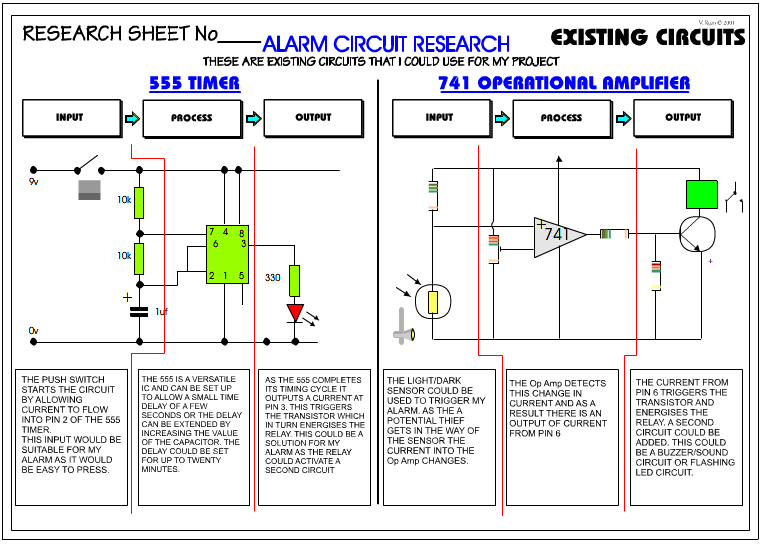 Use circuit simulation software such as Crocodile Technology and place the printouts on your circuit research sheets. Your notes should describe how the circuit performed whilst being simulated on screen. 7. Explain whether or not you think the circuit is suitable for your project. It may be that only aspects of the circuit are suitable. 8. You may wish to use three dimensional drawings of the circuits or ‘real life’ printouts. Alternatively, you may wish to draw precise circuit diagrams or print these out directly from electronics software. 9. Use the internet to research possible circuits. A large range of electronics books are also available. Photocopies of circuits are acceptable, but remember to make reference to the book’s title and author. 10. An existing circuit can be adapted to suit your needs. Look for the circuit that closely matches what you want and alter its outputs or inputs. C. Add brief, clear notes underneath each INPUT, PROCESS and OUTPUT. D. Do you consider the circuit usable for your project? E. Do not fall behind in your work as you will find it difficult to catch up later.